Autumn loved karate, and her father, Marshall, loved teaching her what little he knew. After all, a little self-defense never hurt anybody — or so he thought. Seated on the living room couch, Autumn sprang to her feet and ran to her father’s bedroom. Marshall chased his princess to his bed, where she stood, eyes level with his, fists raised. “After this, it’s time for bath and bed, okay?” Marshall said. Autumn didn’t respond with words. Instead, she charged her father with the quick, precise punches and kicks he taught her to use if someone ever attacked her. Autumn laughed as Marshall blocked, except one kick, which grazed his groin. It was like a bell going off in Marshall’s head: his daughter’s kick had just the right amount of force in just the wrong enough place to make him reel in agony. “Only kick a guy there if you’re in real trouble, understand?” he said. Marshall flipped Autumn onto the mattress and began tickling her. “I win!” Autumn said, laughing. But Autumn was laughing too hard to speak. Finally, Marshall disengaged Autumn, but she was too wound up and continued to attack. After several minutes trying to re-direct his daughter off the bed and into the bathtub, Marshall started to wonder if his princess hadn’t become a monster – a karate monster. Autumn desisted, took a bath and crawled into bed. The next day, Autumn was playing with classmates on the playground after school when her mother, Lauren, witnessed Autumn get into a fight. A male student scratched a female student, both of whom were brother and sister, and Autumn responded by karate-chopping the boy’s chest, causing him to cry. Autumn, however, refused to apologize. The students’ mother quickly gathered her crying son and confused daughter and fled the playground. Next time Marshall picked up Autumn to spend the night at his apartment, Lauren told Marshall about the incident. Marshall, on the other hand, had mixed feelings about his daughter’s mixed martial arts. He knew it was wrong for Autumn to hit the boy, but he liked the fact his daughter stood up to him and protected the girl. 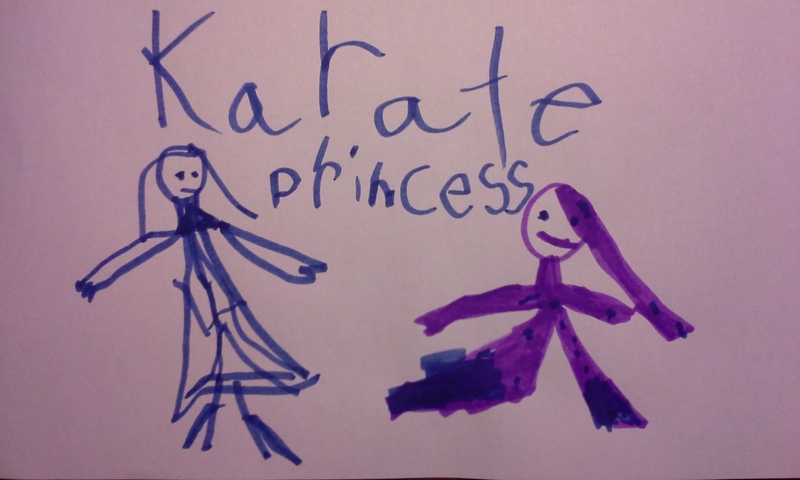 Perhaps Autumn needed to understand there was a time to use karate to resolve conflict, but most of the time words were best. That night, Marshall refused to play karate with Autumn. Instead, he said he had a surprise. Marshall called the story, “Heart & Sword,” about a prince intent on finding a magical treasure that promised to protect his inheritance, the kingdom, from conspiring brothers. The prince found the treasure, which turned out to be a woman, and she taught him the power of kindness, not violence, in solving problems. The prince married the woman, who became the princess. The prince inherited the kingdom and proved to be as wise a ruler as his father once had been, because he listened to his wife. The next day, Marshall and Autumn went to the park. There, Autumn began playing tag with an older boy and sister. “You can’t get me, I need to tie my shoe!” he said. “Yeah, he needs to tie his shoe!” his sister echoed. But his shoe was tied; he simply bent down and re-tied it. Next time Autumn almost caught the boy, he stopped her again. “You can’t get me, I have a rock in my shoe!” he said. He bent down and removed his shoe, but there was no rock in it. Next time Autumn almost caught the boy, he stopped her again with another excuse. And again. And again. His sister always played along. The boy and his sister were taking advantage of Autumn, but it was different from the bullying Autumn witnessed at school. The boy and sister weren’t hitting Autumn or anyone else, for that matter, physically or with words. They were hitting Autumn by playing unfairly with her. That was wrong of them, and it hurt. Autumn became so disillusioned with the game she often stopped chasing the boy and sister, going on the swing or doing gymnastic tricks on the monkey bars by herself. Again Autumn would try, and fail, to tag the boy and sister; again they had their excuses. Marshall looked to see if the siblings’ parents or guardians were present or paying any attention; not surprisingly, they weren’t. As for Marshall, he had seen enough; he decided it was time for his daughter to take action. “Sweetheart, come here,” Marshall said, waving Autumn to the bench from where he sat and watched. “Are you having fun?” he said when she arrived. Autumn turned back toward the playground and hollered at the boy. The boy stood still at top of the slide, mouth agape. He did not move. The boy didn’t respond. Autumn marched toward him; she met him face to face at the top of the slide. The boy nodded, and so did his sister, behind him. The game continued, and judging by the laughter, Marshall thought this time it was enjoyed by all involved. Only Marshall wasn’t satisfied. Driving home from the park, he was curious about his daughter’s choice of words and tone when she confronted the boy. It was a profound insight, and Marshall realized his karate monster was no more. Autumn had become a karate princess, whose words were better weapons than her fists.